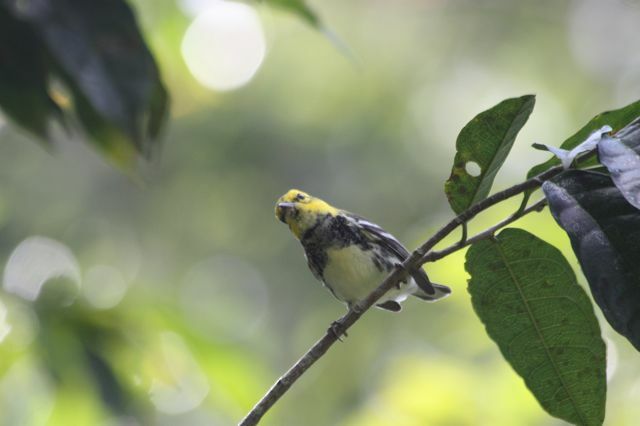 So many birds flitted and foraged through the shade-grown coffee plantation it was hard to focus on any one, but this black-throated green warbler got right up in my grille, so he won for awhile. I took so few truly decent bird photos in Honduras, thanks to rain and generally dark conditions, that I reveled in having a cooperative subject in good light. Ironically, I wouldn't have been in this shade coffee plantation had I not been struck by Montezuma's Revenge (probably from brushing my teeth in tap water, duh duh duh). Why did I think toothpaste had antibacterial properties? It doesn't. So y'all, when you travel in Latin America, brush your teeth and rinse your toothbrush in bottled water. And take Immodium with you. 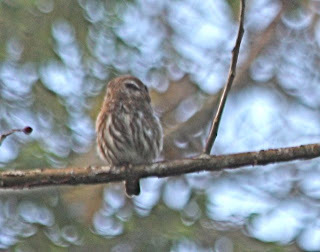 At any rate, I was actually happy to stay behind from the field trips at the first MesoAmerican Birding Festival, and potter around (well, that's an unfortunate choice of words) near the hotel. 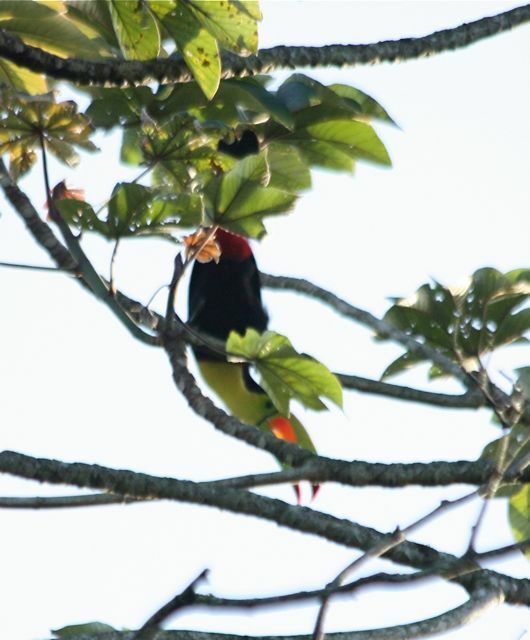 I was floored by the beauty of this keel-billed toucan with the sun coming through his underdrawers. 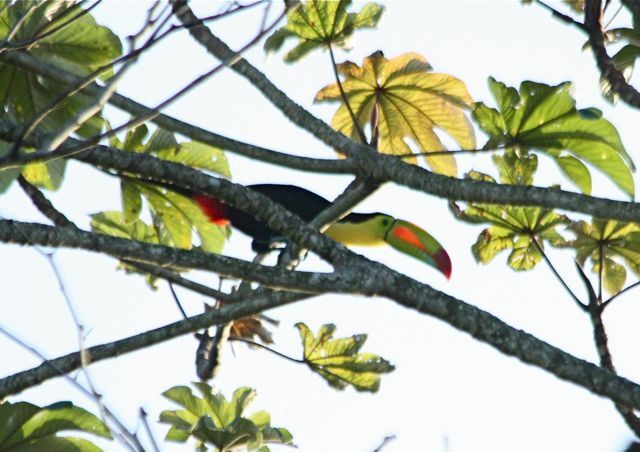 He showed off that acrobatic toucan stuff I love so much. Two other birders staying at Hotel Las Glorias witnessed workers in the shade coffee plantation using slingshots to shoot large rocks at the toucans overhead, which may explain why this bird was scolding me so lustily. 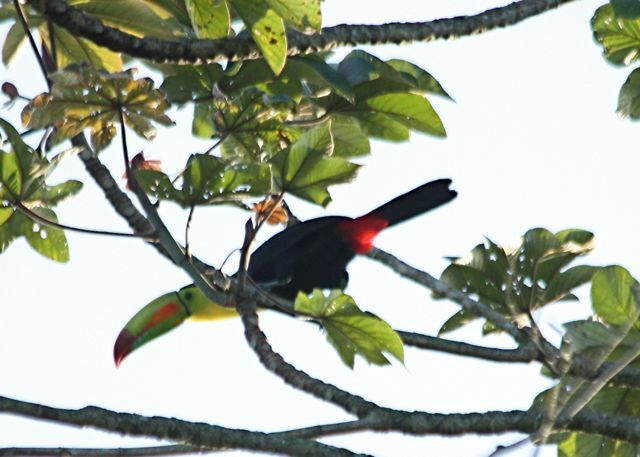 I was horrified when I was told that one had succeeded in hitting a toucan in flight, which dropped several feet but kept flying. Their intent? To injure one and bring it to earth, where they could catch it and sell it to a zoo or for a pet. What greater abomination could you visit on a bird of the treetops and hot blue sky? Displayed for sale in the gift shop at Hotel Las Glorias were slingshots exactly like those I saw tucked into the knapsacks of its coffee plantation workers. 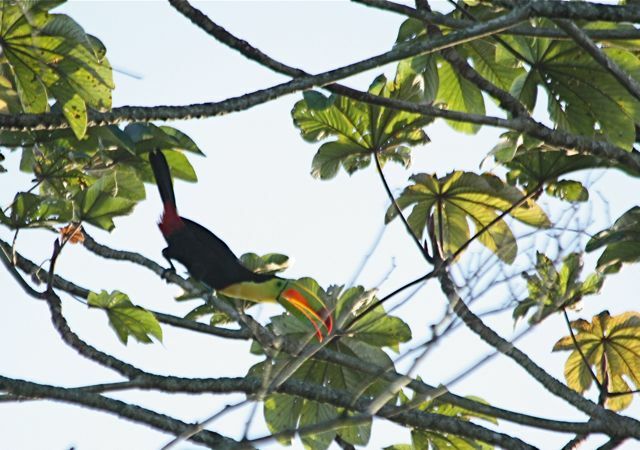 Honduras, as a country, needs to be shown that its birds are worth far, far more on the wing than in filthy cages. If you go, and I hope you do, check that gift shop and ask the proprietors why they have slingshots for sale, if they still do. We did, and our festival participants made a lot of noise about their toucan-shooting employees. We made it clear that's not cool if you want to cater to birdwatchers. Bad form for a host hotel of a birding festival. I hope this big beautiful bird still has the sun shining through his wondrous bill. 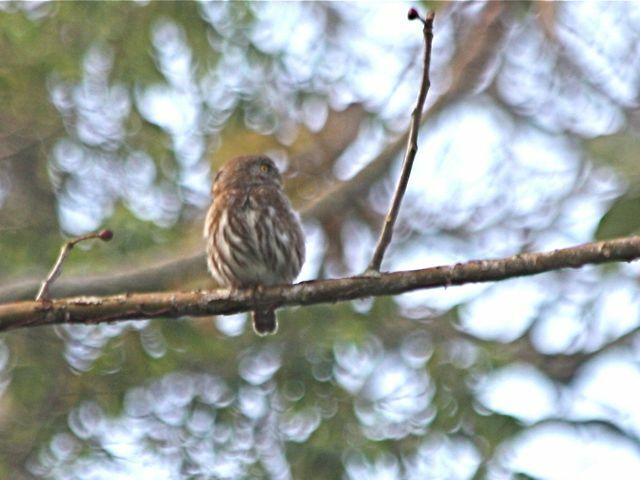 Another malevolently sweet ferruginous pygmy-owl basked in rare sunshine on a long branch. I watched and waited, wanting to photograph the back of its head. Finally I got a profile, but not quite what I was after. Here's the best I could do. 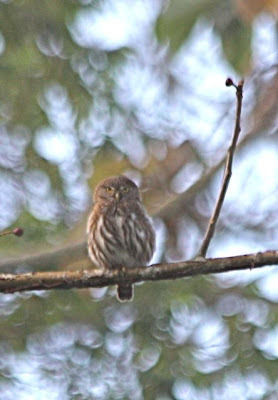 FEPO's, like several other small owls, have marvelous false eye spots on the back of their heads. The "eye" even has a white eyebrow! This is thought to help the little owl when it's being mobbed by other birds--maybe they back off if they think both sides of its head are looking at them. 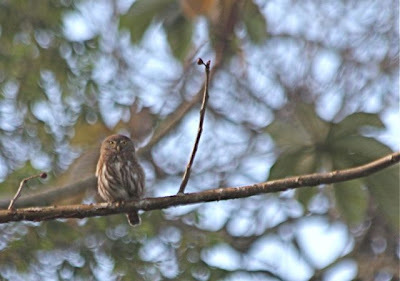 Because the FEPO includes songbirds in its diet, it's not well-liked among the feathered tribe, and being a diurnal hunter, it gets a lot of mobbing grief from its prey. 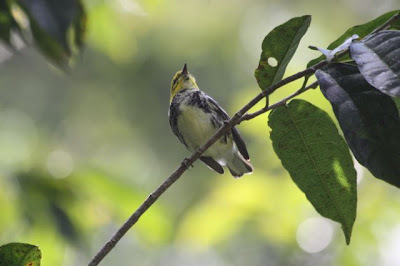 That prey might include "our" magnolia warblers, which are common as beans in the shade coffee plantations. Again, I had the distinct feeling I was being petitioned to spread the word about buying and drinking shade-grown coffee. Although I've not drunk coffee since before Phoebe was born (you don't put caffeine in a shrew, do you? ), I was blown away by the velvety-smooth, rich taste of shade-grown coffee in Honduras. Thanks -- these posts really bring home the benefits of this way of growing coffee. Seeing is believing, or in this case having you see for us. Awesome pics. And info as always! 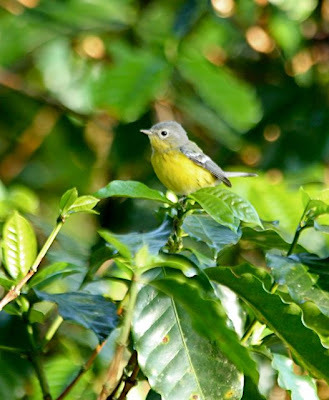 Growing shade grown coffee to benefit birds and holding a birding festival whilst selling slingshots for the staff to shoot bird; sounds eerily like the GOP here in the USA.